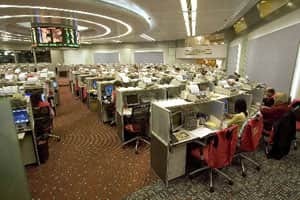 Bangkok: Asian stocks rose on Friday amid improving US jobs and manufacturing data and the expected approval in Italy of an austerity plan intended to get the country’s finances under control. Benchmarks in Singapore, Taiwan and mainland China also rose. Later Friday, the Italian government will hold a critical confidence vote in the lower house of parliament on a multibillion euro austerity package. Despite widespread opposition, the plan aimed at persuading bond markets that the country can emerge from the widening European debt crisis is expected to pass. The country now sits on a €1.9 trillion ($2.5 trillion) powderkeg of debt that could spark a global economic recession if a default occurs. Investor sentiment rose after the US government reported that the number of people applying for unemployment benefits dropped sharply last week to 366,000, the fewest since May 2008. That’s a sign that layoffs are easing, a first step toward bringing down the unemployment rate, which currently stands at 8.6%. Traders were also encouraged by a report from the Federal Reserve of New York that its index measuring regional manufacturing jumped to the highest level since May. That was far more than economists were expecting. A similar report from the Philadelphia branch of the Fed also increased more than analysts anticipated. The Dow Jones industrial average rose 0.4% to 11,868.81. The Standard & Poor’s 500 rose 0.3% to 1,215.76. The Nasdaq rose marginally to 2,541.01. Benchmark oil for January delivery was up 2 cents to $93.89 per barrel in electronic trading on the New York Mercantile Exchange. The contract fell $1.08 to finish at $93.87 per barrel on Nymex on Thursday. In currency trading, the euro rose to $1.3036 from $1.3011 late Thursday in New York. The dollar fell to ¥77.85 from ¥77.91.